These cookies are necessary for the functionality (for some part) of the website. These cookies are designed to deliver the requested service to the user, eg DHB Netbanking. In addition, these cookies are necessary to make the communication possible over the electronic communications network. For more information, read our privacy statement. 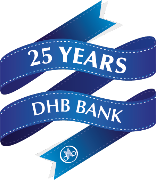 The stored information is used only by DHB Bank. We will handle your data confidentially. These cookies store your personal preferences. We use these cookies to collect information about the use of our website. With this we examine how we can optimize our website. Besides the necessary cookies needed for the site to function properly, our website also uses functional cookies. Above you can choose your preferred cookie setting. You also have the ability to control cookies through your Web browser settings. For more information please contact our privacy statement. >> Not registered for DHB Net Banking yet? Please click here for more information on Net Banking.